Ecommerce platforms generally offer some core transactional and product catalogue functionality and then some additional features that the developers have deemed important – but rarely the features that satisfy the store owners’ most important requirements. Thankfully these platforms understand that an issue exists and have allowed developers to create and market solutions to specific problems in their app stores in Shopify’s case or an extension connect catalogue in Magento’s. From personal experience the quality and suitability of these apps can vary greatly. Some will break your website; others will not work in the way you expect whilst there are a few exceptional apps that can revolutionise how you do business online. For our first look at ecommerce platform apps we will highlight the 10 best available to Shopify store owners. 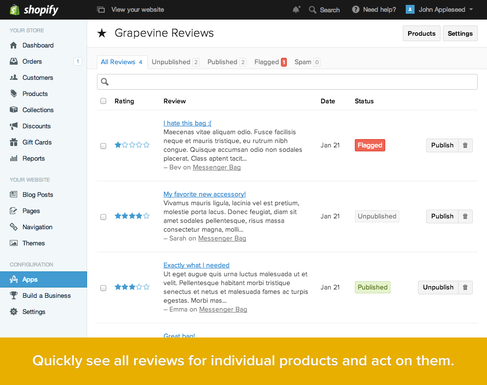 Previously the ability to offer customer product reviews was only supplied via independent app developers. However, recently Shopify decided it would be worthwhile to provide a robust system themselves – and for free. Although there is no method to email customers after a period for them to review a product, which is a highly desireable feature, it does produce rich-snippets star ratings in Google’s search results and is a great way to bootstrap your website when you launch. You can then export these reviews and import them into an enhanced offering such as from Super Reviews or Reviews.co.uk. If you’ve moved your store from an old platform such as WooCommerce, for example, then the URL structure for your store is likely to be very different. Over time you are likely to have built up links to these pages that will now be dead. Not only will they provide a bad user experience, but they will also harm your SEO. The inbuilt method of redirecting pages with Shopify is very poor. You can only do one redirect at a time, you’re not able to manage your redirects en masse – as the above example of a Traffic Control dashboard shows with over 1,400 redirects in place. Ideally before you move platforms you would crawl your old website and get every URL and then decide what the new URL will be for you to redirect. If you have already moved your store you may have an old sitemap file on your computer you could work through, or you could log-in to your Google Webmaster Tools account and get a list of your broken links under Crawl > Crawl Errors and then work out what to redirect. You should then use the Traffic Control Bulk Redirects app to bulk import these redirects and fix these SEO and usability issues in a stroke. You should always keep on top of 404 errors which you can do using the 404 tracking option for an additional $4 a month which will list the URLs which are broken and how many visitors have tried to visit them over a set period. When you first start your website you may not have the immediate SEO ‘power’ of your competition. But you can compete on an equal footing when it comes to advertising in AdWords – if you think latterly. The greatest conversion rates you are likely to witness are those that search for the specific products you sell. Using the Google Shopping/Merchants service you can directly feed your products into prominent parts of Google’s search results using Shopify’s own Google Shopping app. One of the most frustrating aspects of using Google Shopping as a retailer is making sure all of your products have the correct fields adequately filled. This app reports back which products you have issues with and how you can resolve them. Using this this app can help you get a jump start for minimal cost when you first launch your store – and beyond. One thing all store owners should be thinking about is increasing your Average Order Value (AOV) and a particular good way of doing this is to offer free shipping when a customer’s basket value is over a set amount. If you do the math correctly the value of products sold will outweigh the cost of additional shipping – as well as per order picking and packing costs. which will encourage them to buy more. Interestingly, also, it seems to encourage people to add your sale items to their basket. So if you have items that you need to clear out, this app certainly helps in that aspect too. In a perfect world every order that you take wouldn’t need any amendment. But we’ve seen that many small to medium sized ecommerce stores that don’t outsource their fulfilment can have issues with taking orders that include out of stock items. With the out-of-the box system you cannot update an order after it has been received and remove out-of-stock items. This app allows you to add and remove products and handle the repayments that results. Due to security, howvever,, additional payments will need to be processed through your gateway. The amount of time that can be saved using this app is significant. Perhaps not the most exciting app, but this one can save you significant amounts of time. The traditional method may be to use a label writer such as the ones created by Dymo to print off a packing label and then print off a packing list to go in with the order. A ‘growth hack’ is to save time by using an integrated label such as those offered here which allows you to print off all your orders and then peel off attach the label from the same page. This way you wouldn’t need to copy and paste addresses to Dymo – it would all happen from your traditional printer. Using the app allows you to format your packing lists and invoices so you can correctly position the delivery address to match the location of the peelable label. Of course, if you’re outsourcing fulfilment, you’re already using a much more significant ‘growth hack’. Having customers that regularly purchase from you is the key. This wonderful app from Bold allows you to select products to offer at a slight discount if customers elect for a regularly occurring order. This works in exactly the same way as Amazon’s Subscribe and Save. The advantage is that customers will know they have an order due in the near future and will often add extra products to their favourite ones and your average order values will improve too. Emailing offers to previous customers can be a very profitable exercise. If, during, the order process you give people the opportunity to opt-in to your mailing list you can regularly email them with new products as well as end-of-line products you need to clear out. Potentially the greatest feature, however, is the ability to automate your emails based on specific customer activities. For example, if any of your registered customers purchases a specific product or from a category of products you can automatically email them with an offer for related products, or encourage them to follow you on social networks etc. MailChimp is perhaps the single greatest app for enhancing lifetime sales values. One of the most difficult parts of running an ecommerce store at any stage of its evolution is the effective handling of customer enquiries. The ability to filter the different type of contact from product requests, complaints, enquiries, marketing etc. is one that isn’t easily achieved by simply having these contacts sent to an email inbox. Having them appear in a central repository will allow you to divide up the tasks of responding to these queries to the correct people which should improve the service you offer to your customers and not allow you to lose these messages in your other emails. Most Shopify templates are very poor when it comes to informing the search engines that duplicate and shallow content should be ignored. Even Shopify itself doesn’t do a good job of making it an inbuilt feature to control these URLs. Thankfully you can now add noindex tags to search results and other undesired pages.